I’ve had a Chromecastic week playing around with Google’s $35 streaming device. Overall, I’ve come away with positive impressions. Then again, it’s easy to be forgiving when a new gadget costs less than dinner at a middle-of-the-road restaurant. But that forgiveness is key. I’m an iPhone user, and it has become increasingly apparent that Chromecast sometimes works rather fitfully with Apple gear. That’s a tough pill to swallow given the attention Google lavished on the Chromecast’s touted ability to work across Android and iDevices alike—and the fact that Android phones and tablets handle the streaming so well. True, the disconnect isn’t necessarily surprising. 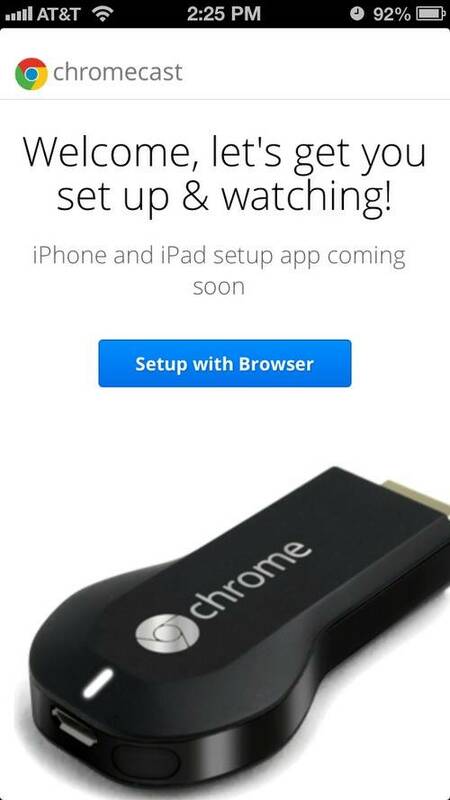 Among other things, there was never much chance that Apple would help optimize the Chromecast experience on iOS. Certainly not in the service of its arch rival, and definitely not for features that compete with its own Apple TV and Airplay. So for iPhone and iPad users, Chromecast comes with some compromises—namely a dearth of compatible apps and a rough-around-the-edges experience. 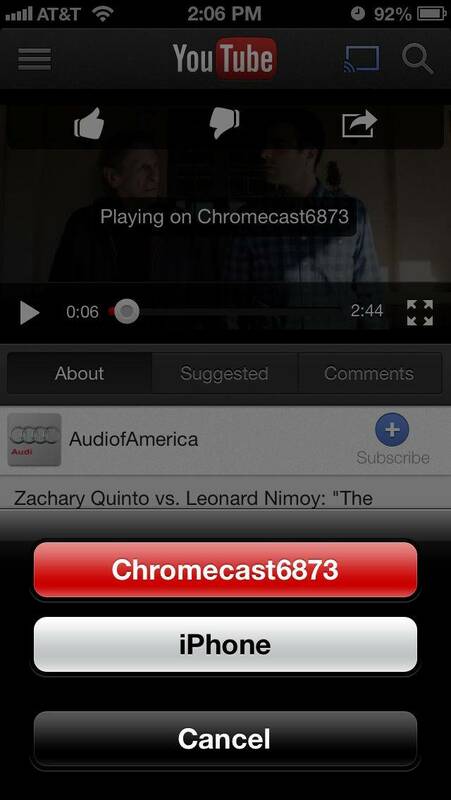 Android users have a handy native Chromecast mobile app to set up and manage the device’s settings. So do Mac and Windows users. iPhone users, however, don’t. It’s not clear if Google simply hasn’t submitted it to the App Store or if Apple is holding back approval, but either way it’s not available. So to configure the streaming stick, we have to do it online from our mobile Web browser. When it comes to apps, there’s an even peskier issue—the actual streaming. Only four mobile apps directly support Chromecast at this moment, and two of them—Google Play Music and Google Play Movies & TV—aren’t available for iOS users. 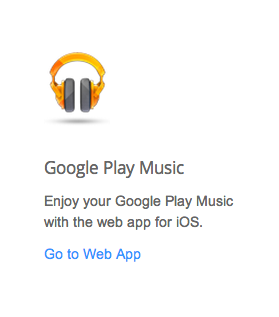 We can listen to Google Play Music via Safari and mobile Chrome, sure, but we can’t beam that music to the TV. Worse, with one of those two remaining apps, iOS users face further compromises. If, for instance, you assumed that Google-owned YouTube would perform better than Netflix, you’d be mistaken—and the disappointment is especially acute on iOS. Casting a video to the TV and remote controlling it from the same device worked well in both cases. Since Google also hyped remote control swapping between devices, I gave that a go too. At various times, both had trouble detecting the current stream. But the Android picked it up more easily than the iOS device. I just tapped the “cast” button and selected Chromecast, and the tablet locked on. With the iPhone, that only worked half the time. I tried another feature: resumptive playback. I casted a YouTube video from the tablet to the TV, and tried to continue it from the same point on my iPhone. It worked. Then I tried to send it back to Chromecast. That was less successful. I tried several times, and often my handset just didn’t want to let it go, no matter how many times I tapped the “cast” button. 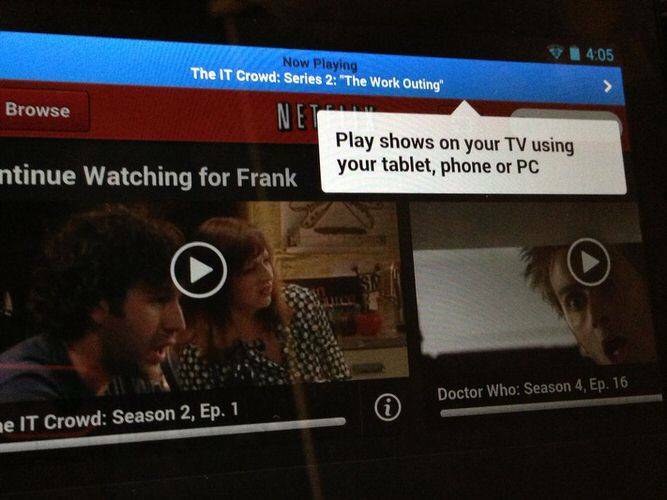 The Netflix app works better on both iOS and Android, and perhaps it should. The company has a lot of experience with streaming and resumptive playback. It also made Chromecast remote controls easier to find. Whenever a Netflix video casts to the TV, a blue banner shows up on every page within the app. No hunting around; users just tap the banner to jump back to the streaming video and its controls. In contrast, YouTube’s iPhone app hides away the casting notification in a side tray that only shows up when the user swipes the screen from the left. This side tray also holds the TV Queue. 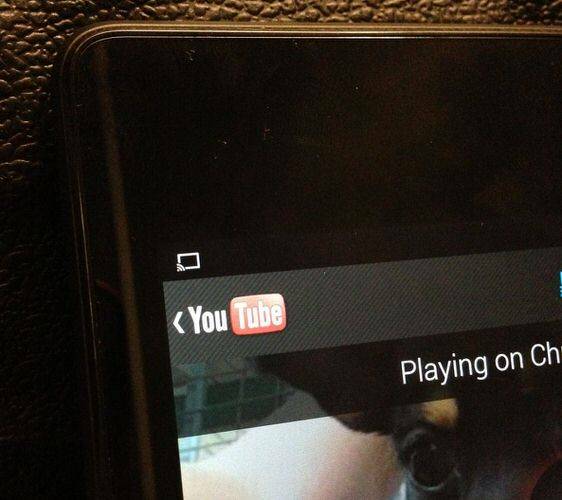 Google hyped this feature, which lets multiple YouTube users create a single Chromecast playlist from different devices. It works differently on iOS than Android. Creating or adding videos to the queue was easy and obvious on my Nexus. Once I had a connection to the Chromecast, an “add it to the TV Queue” immediately showed up on YouTube videos. Once again, on the iPhone, that feature’s buried—this time under the “share” icon in the upper right. I have no idea why the iOS app handles such features differently than the Android version, so I asked YouTube to weigh in on that. I’ll update this post if I get a response. As of publication, I hadn’t heard back. But this ease of use issue goes beyond any single app. Chromecast remote controls are available everywhere on Android. Starting a stream on the Nexus puts an icon in the top left, complete with drop-down controls like play and pause. This stays available, even if you return to the homescreen or use another app. And when the tablet sleeps, touching the screen puts the full-size controls front and center. iOS users don’t get these user-friendly benefits. Instead, we have to fumble around to turn on our iPhones or iPads, enter the app that originated the stream and find the controls in there somewhere. I asked Apple if there was any possibility of Chromecast remote controls showing up in the app tray, like Pandora’s do, or landing on the lockscreen. Predictably, there was no response. In general, Chromecast on iOS feels rough around the edges. And maybe it wouldn’t, if it didn’t pale in comparison to the experience on Android. Little things, like where to put the remote controls, can make a big difference. No one wants to lose track of which video they’re casting or search around just to pause a streaming video. And yet, it’s a compromise I’m putting up with to save a little cash. If it was crucial to have a device that worked perfectly with my iPhone or iPad, that could stream lots of media—including my iTunes library, as well as those from other apps—I would have splurged on an Apple TV instead. But I didn’t. I bought a cheap streaming stick. And so, I take the issues above in stride and adjust my expectations. Of course, it helps greatly that app makers seem intensely interested in Chromecast, so the offerings will likely expand soon. Still, one person’s annoying compromises can be another’s unforgivable problems. If you fall in the latter camp, then there are certainly better, more cohesive experiences available. That is, if you’re willing to pay for them.